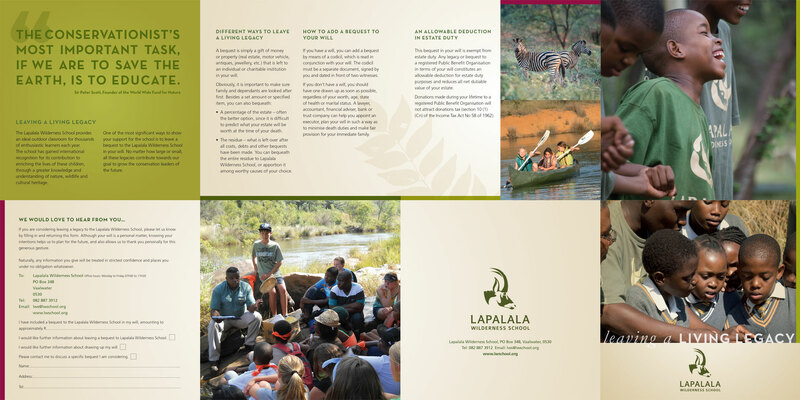 The Lapalala Wilderness School was established in 1985, and is today widely recognised as a centre of excellence for its environmental education programmes that continue to be enthusiastically received by primary and secondary schools right up to university students already specialising in aspects of the conservation and management of biodiversity. The identification and nurturing of the country’s future conservation champions and leaders is the essence of our mission. This is a vitally important task that is being driven by a talented team of educators, all of whom are committed to the teaching of environmental conservation as an essential prerequisite for ensuring a sustainable future for the people of Africa and for the continent’s extraordinary celebration of biodiversity. Donations can be paid by electronic transfer or via a deposit at a First National Bank (please email/fax the deposit slip to us). If you require a tax certificate for your donation of funds or goods, please contact us by telephone or email.